Why hide your ocarina away when it&apos;s not being played? More and more people are choosing to display my sweet potatoes on a table or shelf as a unique piece of sculptural art. 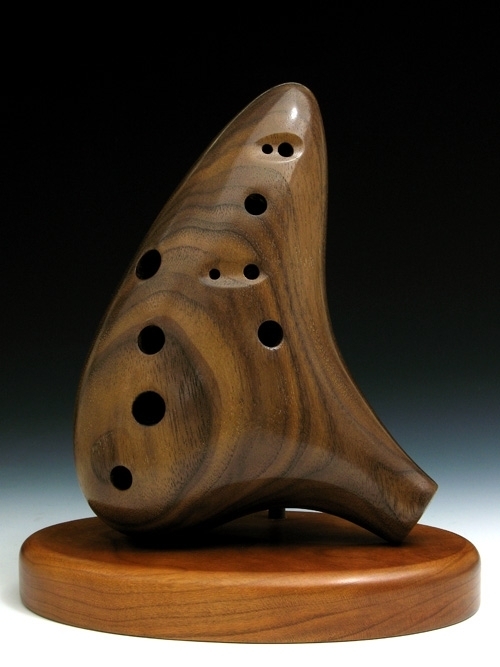 This stand is designed to hold your ocarina in the upright position shown. A rubber coated bronze rod extends from the stand into the right thumb hole to safely and securely hold the instrument in place. The stand is available in Walnut, Cherry, and Padauk. Other exotic woods may be available by special request. The stand can also be ordered with a beautiful Zelda Triforce inlaid into the surface. The inlay is made with Padauk and Yellowheart in a Padauk stand. The Ocarina is not included.